“Do you want to program iPhone apps and iPad apps, but are not sure where to start? little or no programming experience? Then this is your course! Course 1: Master the basics of the C language, which almost all modern programming languages are based on. The C section of the course alone contains almost 4 hours of video instruction and dozens of code examples. In this section you will learn c programming. Course 2: Learn Objective C programming, the language that iPhone apps are coded in. A superset of C, Objective C is a powerful object oriented language. 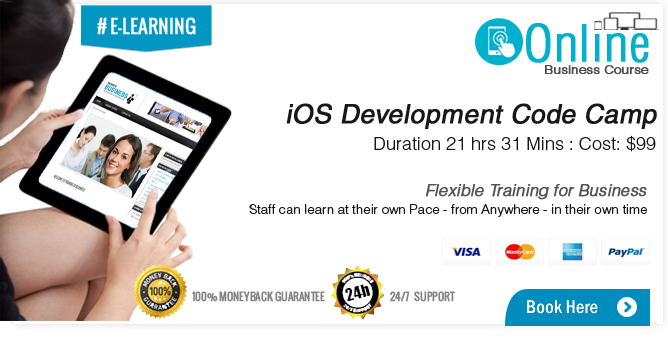 The best iPhone programmers are Objective C masters and this part of the course will have you ready to create and understand iOS code. Course 3: Discover how to program for iPhone and how to program for iPad . This final part of the course applies what you learned about C and Objective C to create actual iOS apps. You’ll review concepts that will allow your apps to function within the iOS environment. You’ll also learn how to exploit the features available in the iPhone or iPad hardware to make more comprehensive applications.